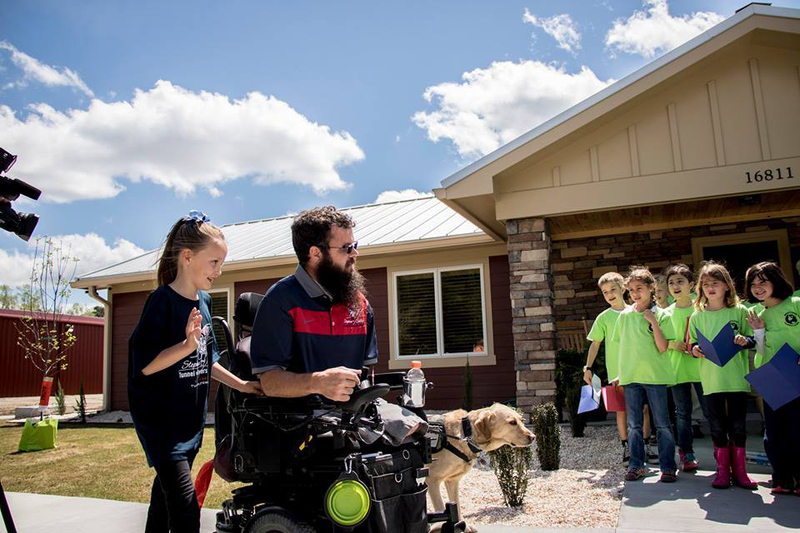 Lance Corporal Thomas Caleb Getscher Receives New Smart Home! On June 7, 2016 LCpl Caleb Getscher, his wife, and their daughter, were welcomed home to their new smart home in Leonardtown, MD. LCpl Getscher suffered the loss of both legs, his left arm, and traumatic brain injury affecting his short-term memory when an IED was detonated while he was on foot patrol in Sangin, Afghanistan. This smart home has features custom built to Getschers needs such as motorized doors, music that can be played on command throughout the house, temperature and lighting controls, and fully automated toilets - many of which can be controlled with an iPad. Carpetonecares.com revealed a sneak peek of the home in March 2015, which highlighted the beautiful flooring installed by Contract Carpet One Floor & Home. There has been amazing support from the Leonardtown community from the start, beginning with the huge turnout at the groundbreaking in November 2015.